Old Western Culture: The Romans is a full year of instruction divided into four quarters: The Aeneid, The Historians, Early Christianity, and Nicene Christianity. 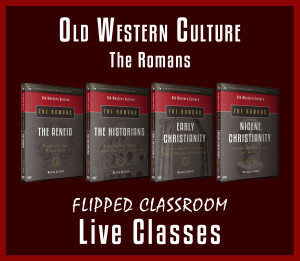 In this “flipped-classroom” approach, students learn from the award-winning Old Western Culture video course, and then meet for live discussion each week with the author of the course, Wesley Callihan. 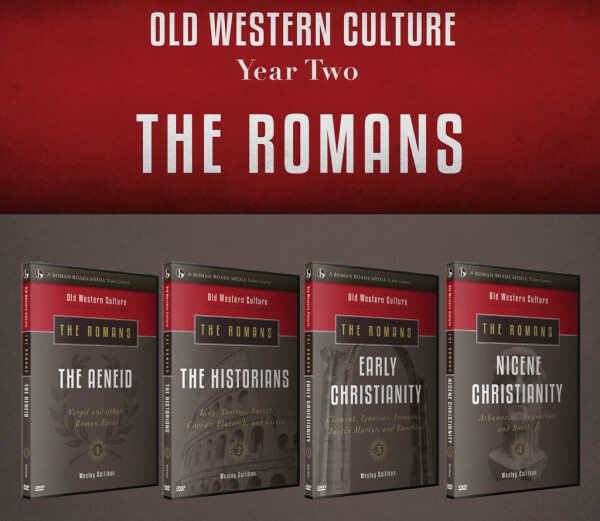 As an integrated humanities curriculum, The Romans explores history, theology, philosophy, poetry, and art from the perspective of the greatest works of influential literature of the Western world. 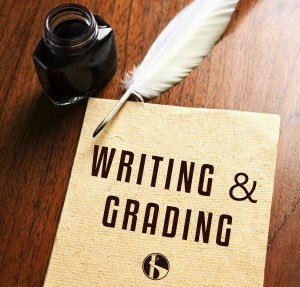 Schola Classical Tutorials does not grade papers or exams, though we do offer this service separately. 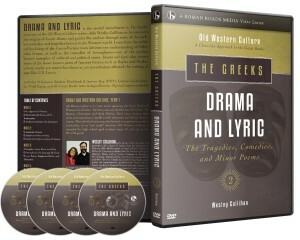 Please note: Roman Roads Media processes the payments and curriculum orders for Schola Classical Tutorials, but the live instruction itself is provided by Wesley Callihan of Schola Classical Tutorials. How this looks will differ somewhat by subject. For literature (Old Western Culture), this means an Oxford style “recitation,” or small group discussion once per week. For Logic this will mean students watch the video lessons on their own, and then meet to go over the lesson 2 or 3 times per week. Since this is an online school, these meetings happen live via video conference. The weekly “recitations” are live audio/video/chat sessions that meet once a week, running from September through early May (see Class Schedule tab), in which the students and tutor discuss the material being studied, go over the students’ work, and preview the work for the next week. The students and tutor log in to a virtual classroom at the stated time for the tutorial and then are able to communicate by talking, typing, and collaborative web browsing. There is no special software needed – it all happens automatically when you log in. Both PC and Mac users are able to participate in these courses, but a highspeed connection (DSL, cable, wireless, satellite etc.) is required. The tutorials are supported by web pages for each class which contain all information necessary for that class. These class pages list the course syllabus, reading and writing assignments and other work, announcements relevant to that class, and additional resources for the students to pursue; the student has access at all times to the class page. 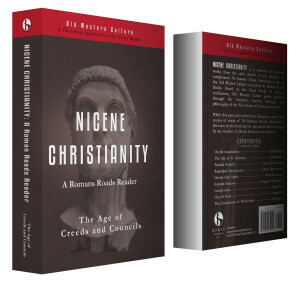 Two High School Humanities Credits, which can be broken down to 1 History and 1 Literature. Each quarter has an end-of-term exam and term paper. The the parent is responsible for grading the exams and papers, as well as for preparing student transcripts.